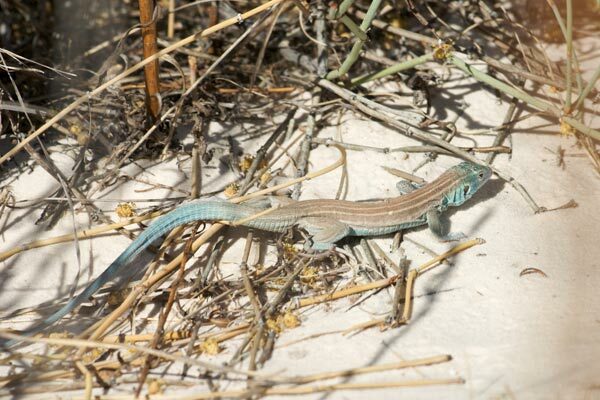 I saw two or three of these colorful-in-a-pastel-sort-of-way whiptails as they noodled around in the white sand dunes. Unfortunately none of them had any interest in staying in one place for more than a second or two, and I was somewhat impatient to go look for the famous white lizards of White Sands, so I ended up with only cruddy whiptail pictures. They're called "Little White Whiptails" because they are much paler than the other subspecies Aspidoscelis inornata, the better to match the color of the dunes.